Current proposals for lunar development neglect our best chance to glimpse the beginnings of the Universe, says Joseph Silk. Plans to return to the Moon are getting serious. Last month, US President Donald Trump declared that the next time US astronauts blast off, they will be headed to our rocky satellite. 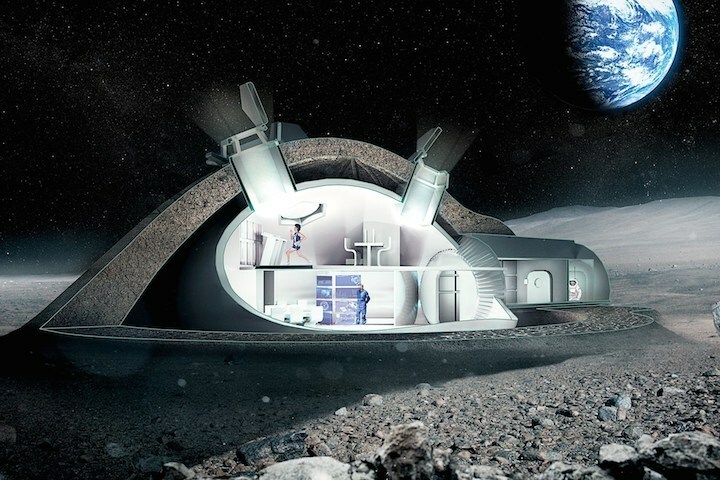 In September, the European Space Agency made its strongest call yet for the installation of a permanent, human-inhabited village at the lunar southern pole. China’s National Space Administration is pursuing a human outpost there, among other lunar projects, and private entrepreneurs are enthusiastic about mining minerals on the Moon and making rocket fuel for further space exploration. But these initiatives are more technical and economic than scientific. Unless we start planning now, they will lack an exceptional asset — a lunar radio telescope. This would be uniquely poised to answer one of humanity’s most profound questions: what are our cosmic origins? The far side of the Moon is the best place in the inner Solar System to monitor low-frequency radio waves — the only way of detecting certain faint ‘fingerprints’ that the Big Bang left on the cosmos. Earth-bound radio telescopes encounter too much interference from electromagnetic pollution caused by human activity, such as maritime communication and short-wave broadcasting, to get a clear signal, and Earth’s ionosphere blocks the longest wavelengths from reaching these scopes in the first place. We need these signals to learn whether and how the Universe inflated rapidly in the first trillionth of a trillionth of a trillionth of a second after the Big Bang. To be sure, observations from Earth and orbiting satellites are impressive. The Sloan Digital Sky Survey, run by over a dozen collaborating institutions, has mapped more than a million galaxies, and larger surveys under way could identify up to ten billion. But these galaxies formed millennia after inflation occurred. The key to understanding early events in the Universe are the relics they left behind. One is a sea of electromagnetic radiation coming from every direction in the sky. Released around 380,000 years after the Big Bang when the first atoms formed and the Universe was much hotter, this radiation cooled over time to microwave frequencies, and is now known as the cosmic microwave background. Superimposed on this background are patterns from scattered photons: vestiges of the gravitational wells that seeded galaxies and other massive structures in the Universe. Studies from Earth-bound telescopes and orbiting satellites have mapped millions of these tiny ripples to produce precise estimates of the age of the Universe, rates of expansion and the relative amounts of visible matter, dark matter and dark energy. In December, one team won the US$3-million Breakthrough Prize in Fundamental Physics for their efforts towards this goal. But these projects cannot robustly detect the predicted fingerprints of inflation — skewed ‘twists’ in these ripples. To do that, we must find the signals that have travelled the farthest in our expanding Universe, and so represent the ‘dark ages’ — the first few hundred million years after the Big Bang, before the first stars formed. To gain the needed precision, we must look beyond the billions of observable galaxies to their building blocks: trillions of clouds of hydrogen gas. In 1944, Dutch astronomer Hendrik van de Hulst theorized a way of detecting cold interstellar atomic hydrogen on the basis of a slight energy change in the atoms at a frequency of 1420.4 megahertz (MHz), a wavelength of 21.1 centimetres. This is now widely used to map the gas clouds between nearby stars. The same principle could let us map extremely remote hydrogen clouds, because inflation imprints a tiny distortion on the clouds’ distribution — called ‘primordial nongaussianity’ — shadowed against the cosmic microwave background. It is the only certain signal from the beginning of the Universe. But these subtle distortions of 21-centimetre radio waves from dark-age hydrogen clouds cannot be detected by current instruments on Earth. The distant signals are stretched by the Universe’s expansion to a much lower frequency of 30 MHz, where Earth’s ionosphere and terrestrial communications render signals unacceptably noisy. Only from the far side of the Moon — with no ionosphere and shielded from Earth-related interference — could we spot these dim shadows. This is where we could verify or falsify theories of inflation and assess whether scientists have settled on too simple a model of the Universe’s early stages. A radio array able to capture these data would probably use millions of simple radio antennas deployed over an area a hundred kilometres across on the Moon’s far side, operated by humans and robots. Infrared telescopes of unprecedented scale could be built in cold craters near the lunar south pole, in permanent shadow where temperatures as low as 30 kelvin have been measured. With no atmosphere to absorb radiation and block signals, Moon-based scopes could yield fantastic images of exoplanets and the oldest galaxies in the Universe. Using the Hubble Space Telescope and the International Space Station, launcher included, as guides, I estimate that all these telescopes would cost no more than 5% of other planned lunar operations. Current proposals neglect the unique opportunity that a Moon-based telescope offers. Astronomers, ESA and NASA should develop the concept and promote the idea now, while lunar plans are still in their infancy. Rocket fuel from Moon ice and dollars from space tourists are grand. But if we really want to challenge the limits of human exploration, we should seek the beginnings of the Universe.